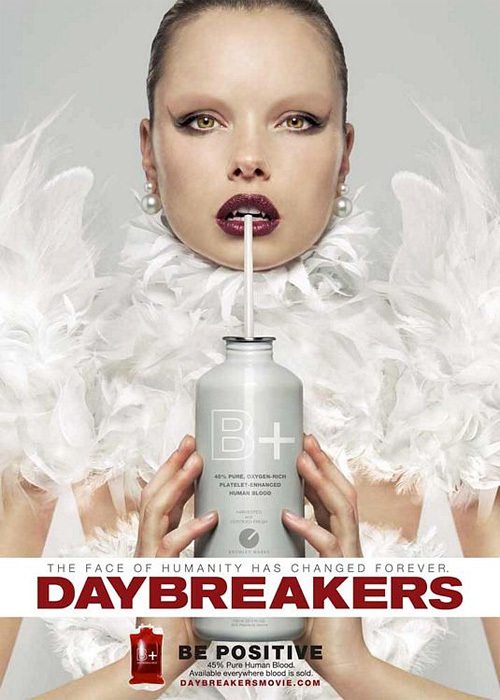 I have to say, I think the marketing campaign Lionsgate put together for Daybreakers was pretty damn impressive (despite only making $19 million at the box office so far). And the many posters they created were the best part, especially the super creepy one that we featured back in December. I thought we'd seen everything, but found over on IMPAwards is one more poster that I just had to featured after seeing it. It's another brilliant design, kind of like True Blood, advertising a blood "drink" you can buy called B+, or Be Positive. This vampire world they've created is brilliant. Bravo Lionsgate and bravo Spierig Brothers. That $19 million at the box office is actually pretty impressive for the film. It only had a $21 million production budget. Double that and you'd include marketing costs. Which means it's already half way to a profit without DVD sales. In short, the film won't be a loss. It's getting some cult steam, which usually means high DVD numbers. This movie was pretty bad. Laughable at most parts. Plenty of blood, but that could not save it. Would never watch it again. movie may not have been too good, but at least it showed the Twilight fans what Vampires are supposed to be, NOT IN SUNLIGHT! I kind of find this one good.